Entry to the competition is conditional on reading and accepting these terms and conditions. 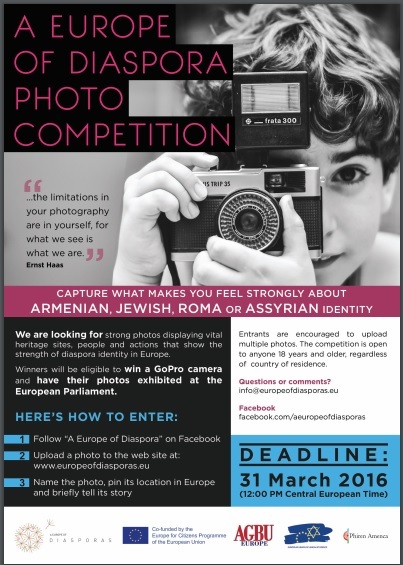 To participate you must upload on the web site www.europeofdiasporas.eu a photo that shows a place, person or moment that makes you feel strong about your Armenian, Jewish, Roma or Assyrian identity. Along with the photo, you should also: 1) name the photo, 2) pin its location in Europe, 3) briefly tell the story behind. Multiple entries are encouraged. Upload: Photo can be uploaded by following this link. Text length: Min 200 to max 500 characters. The closing date and time for entries is before 12:00 pm (midday). Central European Time on 31 March 2016. The competition is open to participants from around the world. The picture must be taken in Europe however. Entries received after the deadline will not be accepted. After the competition closing date, the “A Europe of Diasporas” (EoD) project will shortlist 20 finalists from all eligible entries and publish the winning photos on its Facebook page. The 20 finalists will be notified at the latest on April 20, 2016. Click here to follow the latest updates regarding the competition and our project. The 20 finalists will have their photos exhibited at the European parliament during the “Europe of Diasporas” conference scheduled for May 3, 2016. The 20 finalist entries will go forward to a professional jury selecting the three winners. The 1st, 2nd and 3rd prize winners will have their travel expenses (flight and hotel) from their any European location of their choice to Brussels covered by the project. In addition, the 1st prize winner will also win a GoPro camera that will be handed over during the photo exhibition at the European Parliament. Prizes are non-transferable and there are no cash alternatives. The promoter of this competition is the project “A Europe of Diaspora” (EoD), represented by AGBU Europe asbl. The entrant and the promoter share the rights to the photo. By entering the competition, all entrants grant the promoter the right to use their entries on the project web site or in any other ways appropriate to the goals of the EoD project. Furthermore, entrants agree to have their real names and photos published online as well as at the photo exhibition. The prize winner accepts to be associated with publicity accompanying or resulting from this promotion. By submitting an entry, participants declare that the author of the photo is the person indicated as such on the entry form. The promoter of this competition cannot be held responsible for the use of falsely or erroneously submitted entries. This competition is open to entrants aged 18 years and over regardless of their country of residence. Employees of the promoter and members of their immediate families (including any live-in partner) are excluded from the competition. The promoter reserves the right to verify the eligibility of entrants. The prize winner is required to accept his/her prize by email within ten days of notification. In the event of non-acceptance, a supplementary winner may be drawn at the promoter’s discretion. AGBU Europe, acting for the EoD project, reserves the right to terminate or withdraw this contest at any time. The promoter assumes no responsibility for lost, stolen, delayed, damaged or misdirected entries or for any failure of the website during the competition period, for any problems or technical malfunction of any telephone network or lines, computer online systems, servers, access providers, computer equipment software, failure of any email or entry to be received by the promoter on account of technical problems or traffic congestion on the Internet or any web site, or any combination thereof, including any injury or damage to an entrant’s or any other person’s computer related to or resulting from participating and entering in the promotion. The promoter reserves the right to amend the specification of the prize or offer an alternative prize of equal or greater value. All additional expenses incurred including taxes according to a particular country’s taxation system are the responsibility of the prize winner. The promoter shall be entitled to terminate or modify the promotion or to modify these rules at any time prior to the closing date by publishing any such modification or termination on any website operated by the promoter. In the event of a dispute, the decision of the promoter shall be final and binding, and no correspondence will be entered into. The promoter is not responsible for contacting or forwarding prizes to entrants who provide unclear or incomplete information or for entries lost, misdirected, delayed or destroyed. Any attempt to deliberately damage any website or undermine the legitimate operation of this promotion is a violation of criminal and civil laws, and should such an attempt be made, the promoter reserves the right to seek remedies and damages to the fullest extent permitted by law, including criminal prosecution. Entries are subject to verification and will be declared invalid if they are illegible, mechanically MV reproduced, mutilated, forged, falsified, plagiarised, altered or tampered with in any way. Events may occur that render the competition itself or the awarding of the prizes impossible due to reasons beyond the control of the promoter and accordingly the promoter may at its absolute discretion vary or amend the promotion and the entrant agrees that no liability shall attach to the Promoter as a result thereof. The promoter has organised this competition in good faith and does not accept liability relating to the prize.